We are excited to announce an exceptional lineup for our special Pk Night, which will also mark the launch of BOOM, Charlotte’s first ever artist/community led annual festival of innovative art and creativity. Volume 15 of Pecha Kucha Night Charlotte & BOOM are organized by Que-OS, a non-profit collective of creative professionals. Pecha KuchaTM is devised and shared by Klein Dytham Architecture, Tokyo. The Stage is Waiting for YOU. Present the UNEXPECTED! We know you have amazing, brilliant, and wildly creative things to share – and this is your chance to do it. As always, the only limitations are 20 images, 20 seconds per image, for a total of 6 minutes 40 seconds. No other rules, except – make it unexpected! Pecha Kucha 15 will kick off Charlotte’s first annual BOOM festival, three days of art, performance and the unexpected. Be a part of starting off BOOM with a BANG. Please note: We will be limiting the total number for Vol. 15 to 8 presentations. A panel made up of artists and designers will be selecting the final list of presenters. The selection will be based on the quality of the entries, and the originality of the theme/ideas submitted. We also try to ensure the inclusion of a really wide range of media and topics. On April 8th,9th and 10th, Que-OS will premier BOOM, Charlotte’s first artist-led annual showcase of experimental/contemporary performance and visual art. 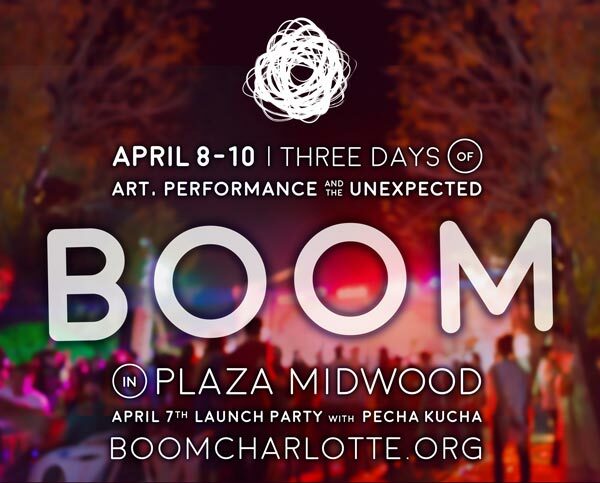 This first installment of BOOM will bring together local and national acts through a collaborative weekend of performance in the Plaza-Midwood neighborhood utilizing local business spaces and performance venues. BOOM aspires to expand the reach of art and culture outside of Uptown and establish it at the “fringes” of the city. This carefully curated compilation of visual and performing arts will integrate the local community and expose Charlotte to the wealth of innovative original work created in our region and across the country. 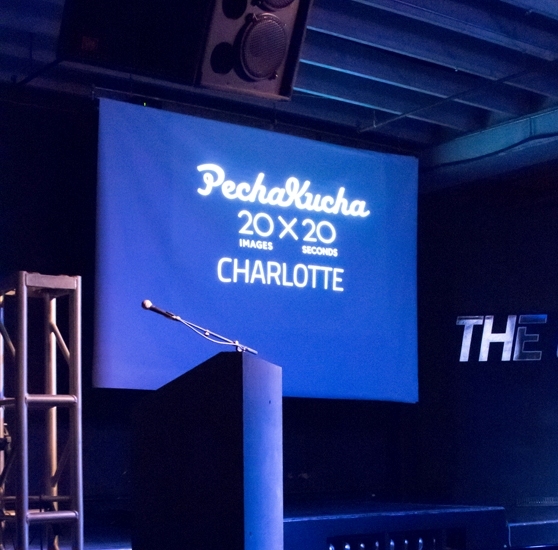 After a brief hiatus, Pecha Kucha Charlotte is back. This time we will be a part of the weeklong South End Soul celebrations in April, at one of the coolest music/performance venues in town. We know you have amazing, brilliant, and wildly creative things to share – and this is your chance to do it! As always, the only limitations are 20 images, 20 seconds per image, for a total of 6 minutes 40 seconds. No other rules, except – make it extraordinary! 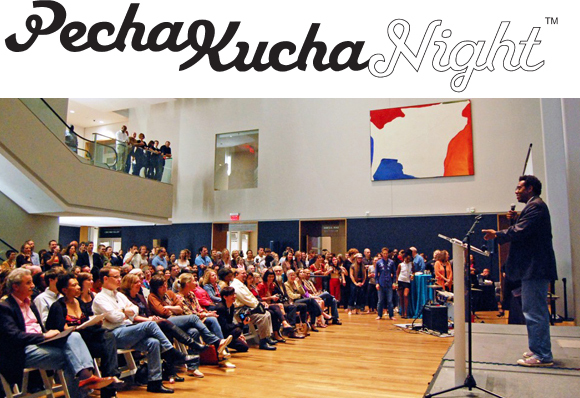 Pecha Kucha has become the one of the most acclaimed and popular cultural events in town. This special event should offer you an even more prominent a stage than ever before. Have an idea for a presentation? We will be limiting the total number for Vol. 8 to 10 presentations. A panel made up of artists, designers, and architects will be selecting the final line up of presenters. The selection will be based on the quality of the entries, and the originality of the theme/ideas submitted. The panelists will work with would-be presenters on refining ideas & honing quality of presentations. The Deadline: Final presentation package due 5:00 PM on Monday, March 28. 1. Designer needed for making updates to the website and refining presentations. 2. Social media rep, for assisting with our presence on Facebook & Twitter, and promoting our selected presenters. All point8/Pecha Kucha events are made possible by the voluntary effort of a few dedicated individuals. Be a part of that special group! Please let us know if you can help.